But wait there’s more…But Wait There’s More! That’s right – you might not even have the base game yet (but if you do – yay! Let us know your thoughts!) – but we’ve already got some expansions coming your way. The first is called That’s The Best Part, and I have to say, it really is the best part! It’s one of my favourite things about the game! Here’s how it works: After someone pitches a product with their two features (one that came in halfway through after stating But Wait There’s More!) – it’s opened to questions from the audience. The player to your right then asks you a question from one of their That’s The Best Part cards. The question could be something like “What if it gives me a rash” or “What if I accidentally flush it down the toilet?” and the person pitching has to respond with “Oh…that’s the best part…” and go one to explain why this product giving you a rash is the BEST part! I laugh every time I hear it! Check out the Toy Vault website for more info on this $4.99 expansion. It should be available in a month or so!! Awesome! 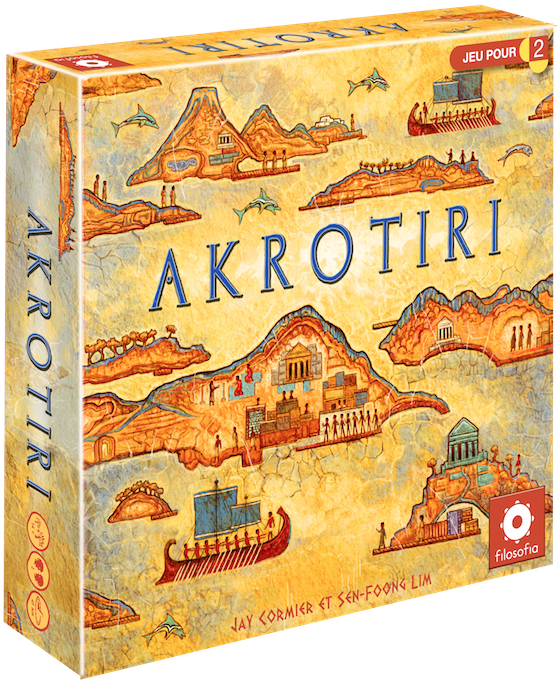 I had a 10 A.M. meeting set up with Filosofia and Z-Man Games so I got there in and set up Akrotiri with time to spare. As some of our more faithful readers might recall, Z-Man has had Akrotiri for a while now, but with the acquisition of Z-Man by Filosofia, Sen and I felt they might need more time to figure things out. We had heard that they played it, liked it, and needed more time with it. We played a 5 player game with Zev, Sophie, JF and Martin – all from Filosofia – plus Rob Bartel (one of our GAC colleagues). This wasn’t a typical pitch because they knew the game as they had all played it; this was more of a confirmation of their desire to publish it or not. There were also a few new concepts and mechanics added to the game since some of them had played it last, so I wanted to highlight those changes for them first-hand. Overall, the playthrough went well. We learned that there was too much downtime for a 5 player game so it will be a 2-4 player game if they do pick it up. 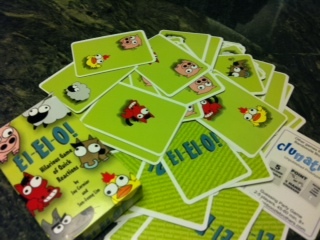 We also learned that getting new goal cards was too expensive and added an unnecessary level of thinking to the game. We brainstormed some ideas on the spot and came up with a great solution – giving players free goal cards after finding their 2nd and 4th temple. JF really seemed to like Akrotiri and proposed we play it again with fewer players to playtest this new rule and consider its effect on downtime. Zev and Sophie had another meeting to go to, so JF and I quickly set up a 2-player game. The new idea worked beautifully! The game took less than 45 minutes to complete and it was great to receive new goal cards throughout the game! We packed up Akrotiri and moved on to EIEI-O. Now, here`s an interesting story about the power of social networking! Dylan Kirk (designer of Genji and fellow GAC member) is a friend of Joyce Lam – owner of the Chinese game publisher, Jolly Thinkers (which is also a gaming cafe). Dylan recommended that she check out Train of Thought as a possible import, as Jolly Thinkers specializes in educational games and he thought the game might have potential for ESL students. Since both Joyce and I went to Essen last year, we arranged to meet up while we were there. I showed her Train of Thought, which she enjoyed and took a copy back with her to China. She tested it there and found that it didn`t work as well as planned, unfortunately. No biggie. 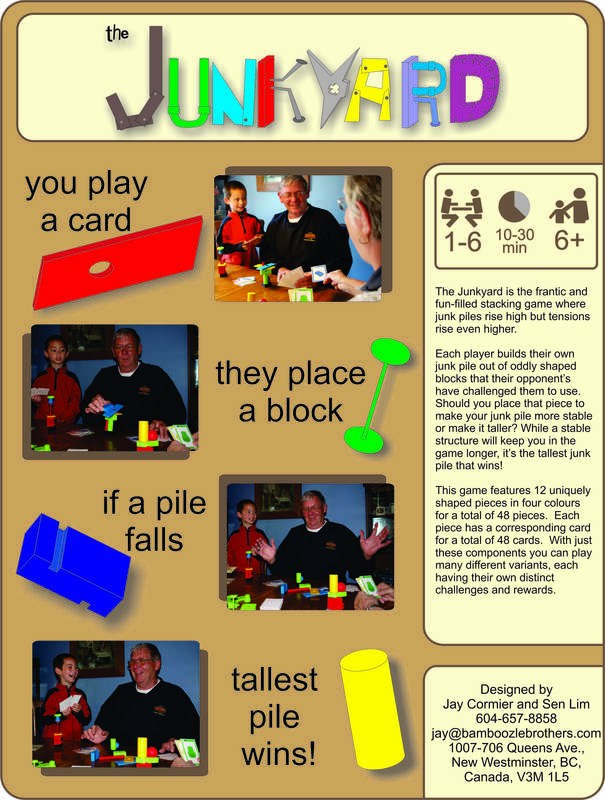 Months later, Joyce emailed me and asked if we had a nice-looking prototype that we`d like to get professionally printed as she knew someone who was starting up a boardgame printing company that wanted to have a portfolio of some designs. Sen and I thought about it and decided to submit EIEI-O – our is a quick reaction game of making barnyard sounds and wacky animal actions. When the final product came off the presses, Joyce sent us a picture of the game in it’s printed glory – it looked great! So, being proud of our brainchild, Sen and I posted the picture on Facebook – like any other loving parent would! Here’s where Filosofia comes in. Sophie is Facebook friends with Sen – he`s working on another game (Midnight Men) with Yves Tourigny that has been signed by Filosofia. So when she saw the photo, she commented that she would like to see the game sometime – pretty wild! And now back to the Gathering. Luckily, I received our nice, shiny copy of EIEI-O exactly one day prior to me leaving for the Gathering – talk about timing! JF was keen to play so we gathered a few other people to take it for a whirl. It was quick and fun. Everyone seemed to enjoy it. As we were finishing up, Sophie came back to the table so we played the game again! She brought Matthias from Abacuspiele with her to play. After just one round of playing, Sophie said that she`d “like to do it”. Double entendre aside, I still had to ask for clarification, querying if that meant we were moving towards a contract. Not only that, but Matthias liked it as well. Sophie asked if he`d like to do the German version of the game. They asked for another prototype, but I only had the one! So she asked me to send her the files as they have access to a print-on demand service that can produce short runs. She said she`ll make a few more copies and send one to Matthias to assess. Second day at the Gathering and we actually got a game signed! The only issue was that they want a different title for the game. Apparently, EIEI-O doesn’t translate well in German! Sophie made a bet with me that whoever comes up with the title gets a free meal from the other person at the next Gathering! I jokingly pointed out that she has final say on the title so the contest seemed a bit fixed. She replied that she was trying to bamboozle me. It was a funny moment as she had only recently learned what “bamboozle” means! Sophie then asked how the second game of Akrotiri went and JF was very enthusiastic about it. I asked Sophie what the next steps for Akrotiri would be. She said that she’d like to play it as a 2-player game one more time when she gets back to work and she’d let us know in 2 weeks. She asked if we’d be open to making this a 2-player only game. I said we were open to it, but it works perfectly well as a 2- to 4-player game. So, we’ll see what she decides. We’re hoping to keep it 2-4 players. The Filosofia crew were evaluating a few other designs from an American designer, Chris Handy (who I went to see Cabin in the Woods the night before), and they asked if I could stick around to play his prototypes. Of course I could! Apparently, Z-Man has had one of Chris’s designs for quite a while and were using the Gathering as an opportunity to come to a decision (much like they did with Akrotiri). 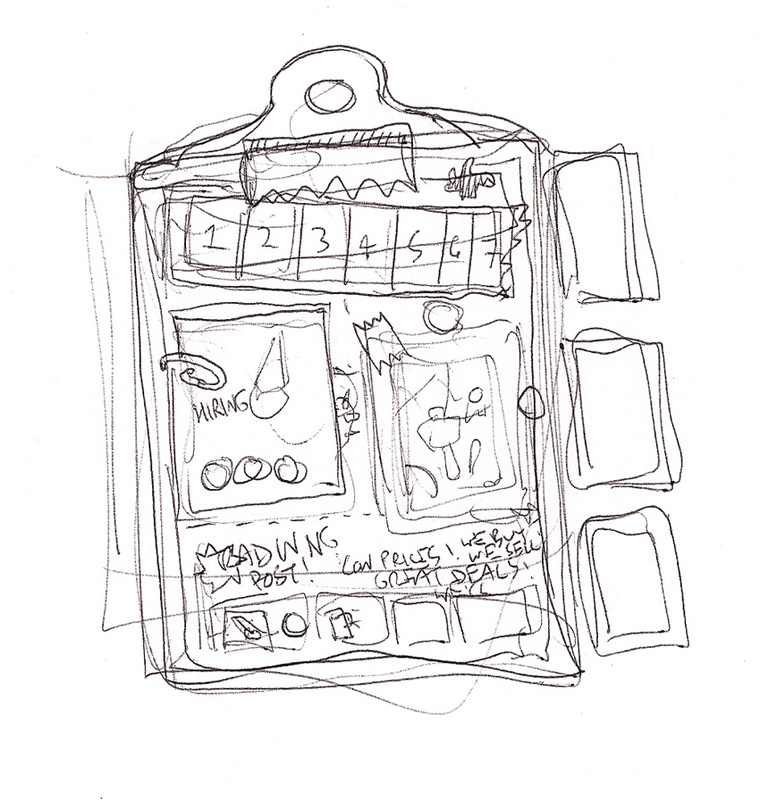 The first game, Heist, was a tactile game in which players reach into a bag to feel for specific shapes, depending on which room they entered. It was a fun idea, despite some challenges. 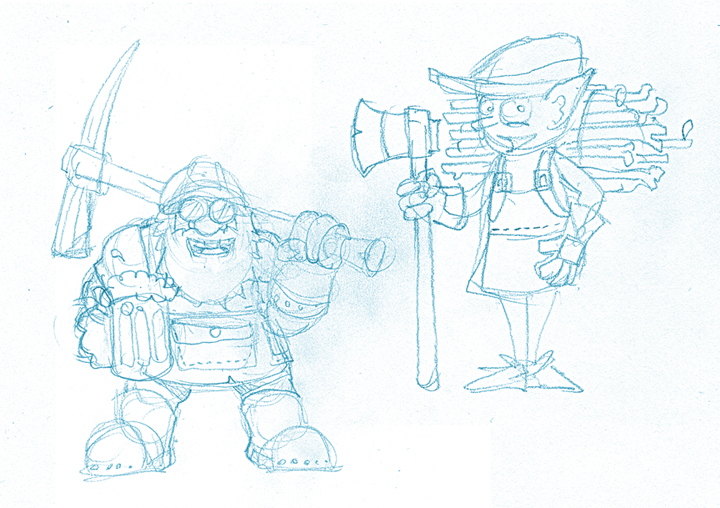 When broke for lunch at TGIF, Chris, JF and I brainstormed about how to improve the game. 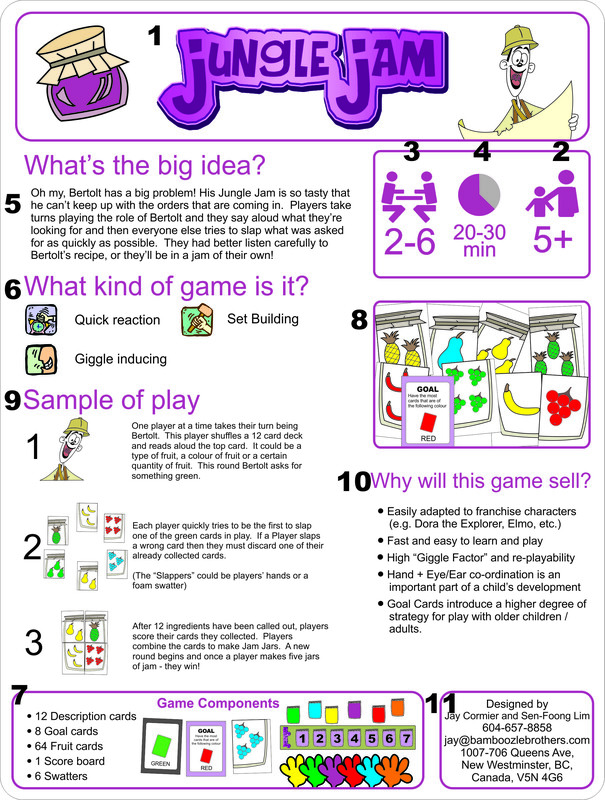 We came up with some more ideas on how to speed up the game and make it more of a fun party game. One aspect this process reminded me of how rigid Sen and I were originally in regards to changing the scoring for Clunatics – Chris really wanted the card that determined which room each player wanted to enter to be revealed one at a time. Once we determined that the amount of strategy that process added didn’t really fit well with the type of game Heist was shaping up to be, we decided a simultaneous reveal would be much better. A few more tweaks were added and we tried this new version of Heist – it was awesome! As we finished one round, we saw Zev walking around and got him to play a second one with us now that we tweaked the rules. The game couldn’t have went any better! It was fun, engaging and tense. 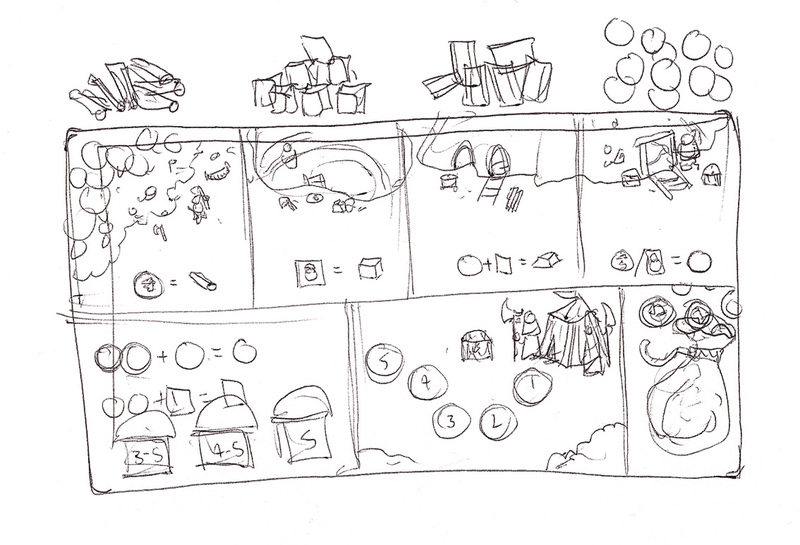 In addition to Heist, we also worked on another game by Chris called Wild Wild West. We fiddled around with the rules on that one too and made some progress in the right direction (in my opinion at least!). I think it was good for JF and Sophie to see how collaborative I was during this whole process. I tried to ensure for my entire time at the Gathering that it wasn’t all about our designs. Afterwards, I showed them Junkyard and Eat at Joe’s. JF liked Eat at Joe’s and thought that it would be a better fit with a publisher like Gamewright. Then we played Junkyard. I informed them that Wiggles 3D had exclusivity until June 1st. JF expressed a lot of interest in Junkyard and asked a few times to let him know if Wiggles 3D passes on it. It’s reassuring to have multiple options for our games! Finally, I asked JF if he’d be interested in seeing a game of ours that is currently in Alpha state. I had brought Box Office (crappy title!) more to play with other designers to get some input on which direction we should take the game. I had played it earlier with Rob and got some great ideas about where to go next but I decided not to waste this opportunity with JF, because he’s a movie nut like me. I showed him the concepts and some of the mechanics we came up with and JF was impressed. He said he would definitely want to see this game once we get it polished! Wow – that was unexpected! To have a publisher want to look at a game that we haven’t even finished yet? Coolsville! We were hungry so we walked over to Canada to find something to eat. It was nice to get some fresh air, see Niagara Falls, and eat something that wasn’t from TGIF! At dinner I got to hear the whole story from Chris Handy about how he got into game design. We realized that our passion for game design very similar. Later on, I invited him to join the Game Artisans of Canada. Even though he is American, he can join as a Friend and still get a benefit from the group. Then, looking at the clock, I realized that the day was now over and I had spent the entire day with Filosofia – what a great day! What’s the difference between a simple game and a clean game? A simple game has reduced decisions and strategy and a clean game can be any game that is streamlined where everything fits and makes sense and has no extraneous rules or pieces. This concept took Sen and I awhile to understand actually. We could easily recognize when one of our games was messy and convoluted, but would often think that the solution would be that we should make it simpler. In the end we would end up with a very basic – but still messy game! 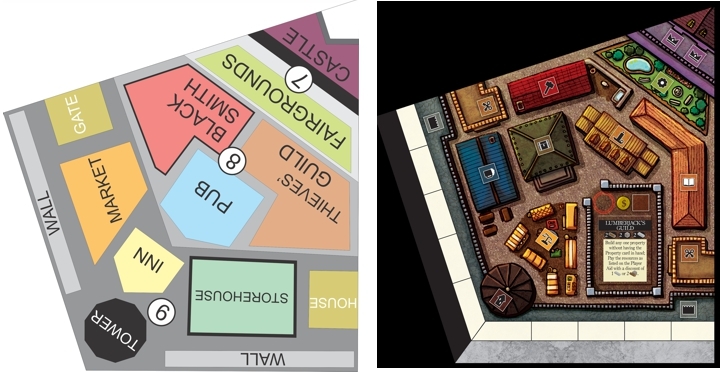 Let’s look at the difference of each by using some examples from one of our games in progress: Akrotiri. In Akrotiri, part of the game has players moving their boats from island to island picking up resources and then shipping them back to Akrotiri to sell them. Seems easy enough, but we were continually challenged with how to determine the prices of how much Akrotiri would buy these resources from players. The Simple way to do it would be to set a fixed price and say that every resource is sold for 1 gold. That’s just too simple and offers no strategy and cannot be affected by a player’s choice at all. 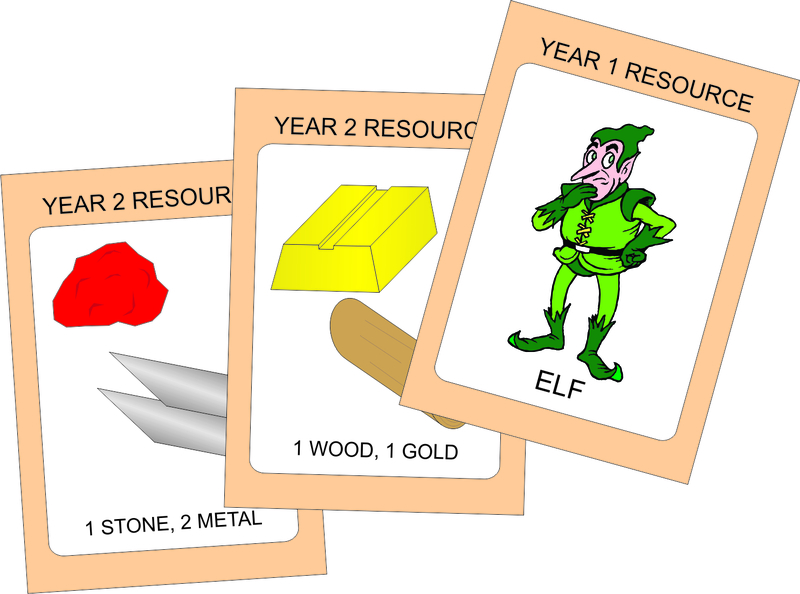 Our initial idea was to use a stock market to track each resource’s value. Every time a resource is added to the board then the stock market goes up by one. If a resource is sold to Akrotiri then the market goes down by one for that resource. Seems like it makes sense, but it wasn’t clean. Why not? 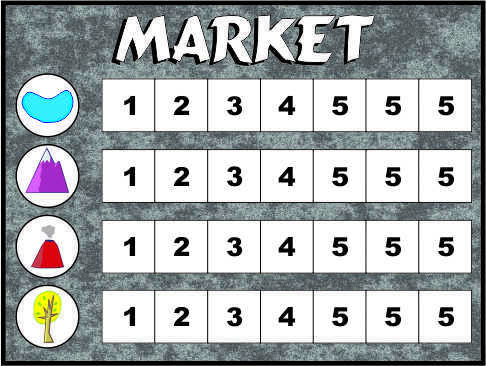 Because players would often forget to change the market when either adding a resource or selling to Akrotiri. It was messy and caused players to say things like, “oh I sold that resource last turn but forgot to lower the price – so it should be 2 steps lower.” Not a good gaming experience. We toyed around with some other ideas before coming back to this stock market idea. This time we placed all the resources on the market itself. If a resource is added to the board then it is taken directly from the stock market. When it is sold back to Akrotiri then it is placed back on the stock market tracker and the player gets the amount that it is placed onto. Now that’s a lot cleaner. Now players can’t forget to affect the market. So when designing your games try to be objective and determine if it’s simple or clean, and unless you’re making a game for children, lean towards clean! First off, thanks to Sean of the G.A.C. (Game Artisans of Canada – a group of designers that Jay and I belong to) for his assistance with coming up with the current stock market mechanism. Secondly, there’s nothing more rewarding than coming up with creative solutions to a problem that doesn’t increase the analysis paralysis or downtime – and that’s the difference, for me anyway, between a simple game and a clean game. Though, personally, I prefer referring to them as “simplistic” vs. “elegant”. Semantics, I know. To me, “elegant” means also linking multiple mechanics in the same game to affect the outcome as a whole. To me, a simplistic game can be made by reducing the rules and components until you’re left with the most basic elements of the game. There is very little interaction on the board or between players. Think of a classic “roll and move” game like ‘Snakes & Ladders’ – you roll, you move, the board tells you if there’s a penalty or a bonus based on the square you land on. Two players never interact. First one to the end wins. An elegant game, to the contrary, may have some very simple mechanics (and, in fact, works better if it is made up of primarily simple mechanics) but the complexity is built into how those mechanics interact. 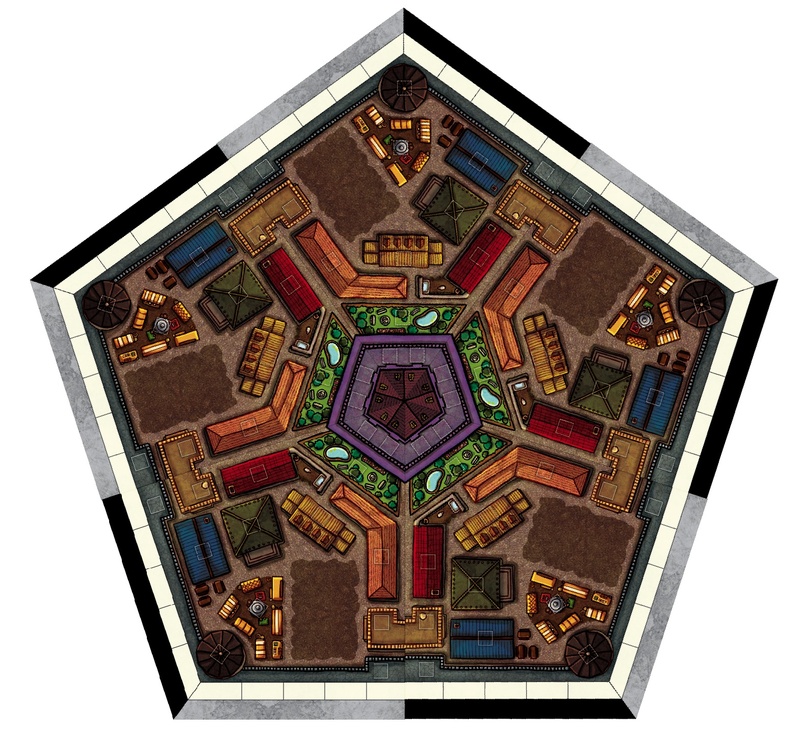 How the board, the pieces, and the players interact with each other all form a meld of complexity. The art, here, is making it as seamless as possible – hence elegant. It should, at the best of times, come off smoothly without much down time or referring to charts or manuals. It should be minimal in execution, but maximal in effect. 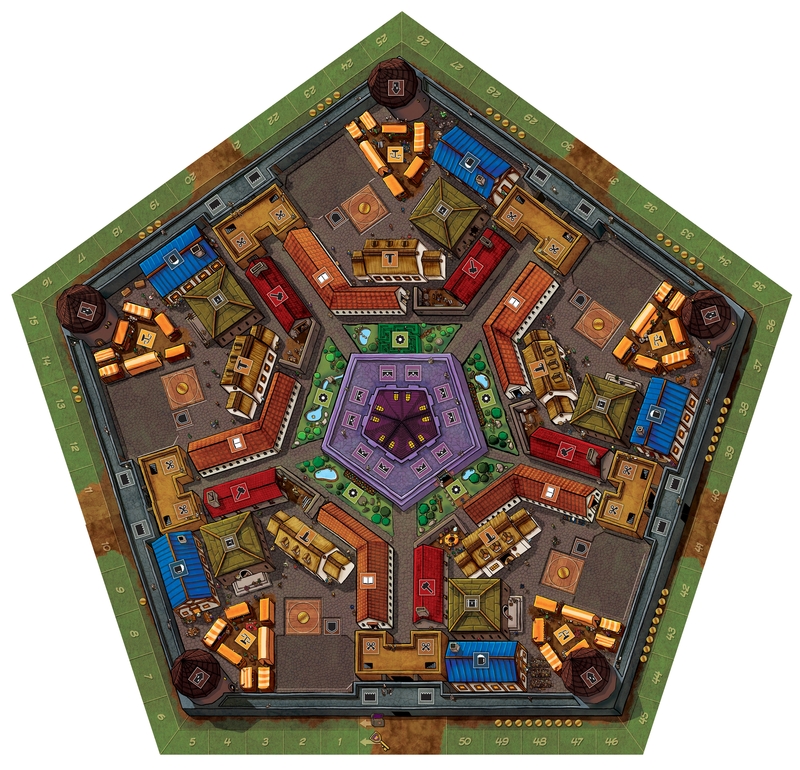 Think of something as simple as the event die in ‘Settlers of Catan’ 2-player card game – roll a die and something happens. The elegant part of this was that both players were affected by this die roll on either player’s turn, but not necessarily in the same way, depending on the buildings they had, the resources they stockpiled, their contingency of warriors, etc. It was a simple roll with simple rules to effect each result (compare who has the most red points in knights – that player gets a benefit) and both players took part in the event phase, even on the other player’s turn which keeps things interesting. And the result of the roll can be more or less beneficial depending on how well a player planned in his or her previous turn. Almost zero downtime for a ton more effect in the game. Definitely a worthwhile trade-off if you were to do a cost/benefit analysis. 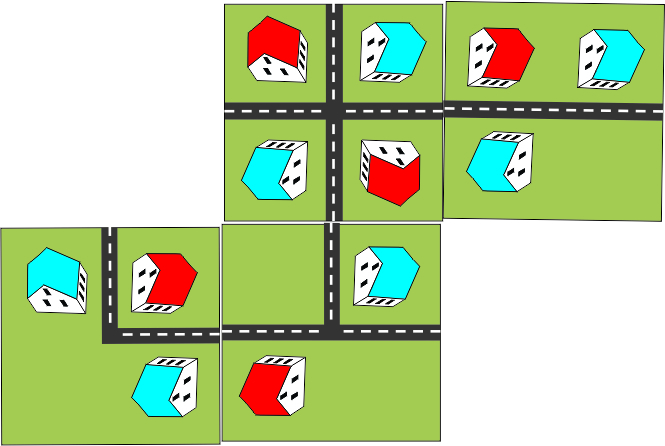 Both the ‘Snakes and Ladders’ and ‘Settlers of Catan Card Game’ example use a single die as the mechanism. The difference is in the ramifications of the die roll. One is simplistic, the other is far more elegant.